Marie was inspired by Fairies, with their “strong, yet graceful presence, their confidence and power from within. 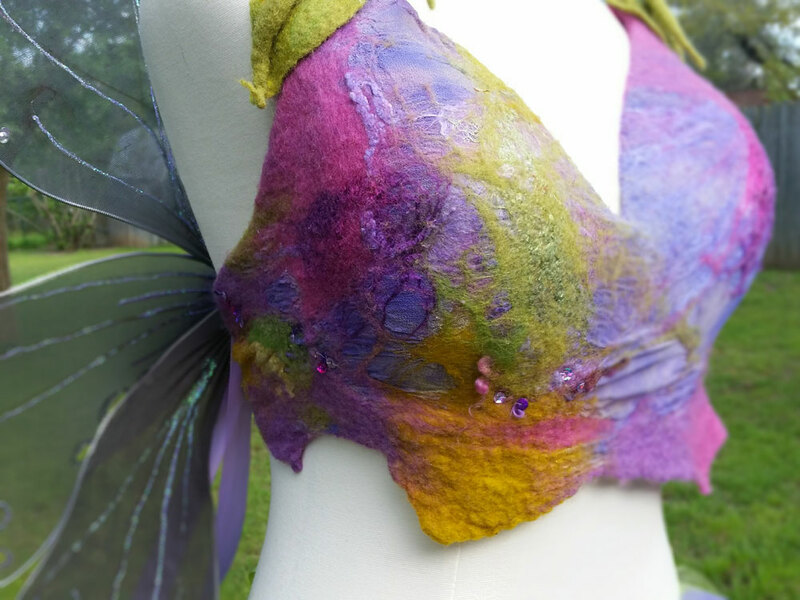 They do not seek approval, they love being themselves.” She used Merino wool, silk chiffon, bamboo fibers, a variety of silk fibers, mohair, sequins, other sheep’s locks and dye to create her whimsical bra, and experimented with a new (to her) technique of wet felting to create the ties on the bra. She also used a process called “nuno felting” where she dyed the silk chiffon, some of the silk fibers and some of the sheep’s wool. The fabric is first made through a laborious process using soap, water, and agitation to cause the fibers to interlock and bind together, while also merging with the silk chiffon. The resulting nuno felt fabric was then stitched onto the purchased bra. Marie also made fairy wings and a tutu to complete this whimsical yet stunning costume, and says that she would like it to be in honor of the model and the winning bidder. If it is chosen for the benefit, I feel it will be worn by just the person who is meant to wear it.” More examples of Marie’s exquisite work featuring felting techniques can be seen below.